Even though Italy did not exist as a state until the country's unification in 1861, its immense contributions to the cultural and historical heritage of Europe and the world are now recognized as distinctly Italian. The history of Italy in the nineteenth century was one of struggle, for unity and for political autonomy as defined by the Risorgimento movement, and of victory, later realized in the democratic successes of 1861 and 1871. The political, social, economic and cultural changes and reforms of the late 18th and 19th centuries, including a several foreign invasions, most notably by Napoleon Bonaparte and the Austrians, several revolutions in 1848 and the turbulent Risorgimento, resulted in a series of minor and major changes in style in the Italian art forms and cultural expression. The goal of freedom was embraced by the artists and theorists of Romanticism, a movement that gathered force in the first decades of the nineteenth century and grew to dominance by mid-century. The Italian movement took another direction, separate from the German romantic school, with an emphasis on patriotism, Christianity, and humanity, and their relentless search for truth, which defined literature in Italy for more than half a century. The Romantic ideals of Manzoni were further strengthened by the writings of Giacomo Leopardi. While not as well known as Manzoni during his lifetime, he is considered the great lyric poet of the age. He created a remarkable and renowned poetic work, related to the Romantic era. The political side of the movement was futher strenghtened by the later Romantics. The literary movement that preceded and was contemporary with the political revolution of 1848 may be said to be represented by four writers - Giuseppe Giusti, Francesco Domenico Guerrazzi, Vincenzo Gioberti and Cesare Balbo. The Sicilian Luigi Pirandello an Italian dramatist, novelist, and short story writer awarded the Nobel Prize in Literature in 1934, for his "bold and brilliant renovation of the drama and the stage." Carlo Collodi wrote one of the world's best known children's stories Pinocchio in 1883. Giuseppe Verdi (1813-1901) was the most important opera composer of the 1800's. His most famous works include Rigoletto and Aida. See: Italian opera. Italian architecture in the 1800's is characterized by the neoclassical period (1750 - 1850), a return to the simple, yet elegant classicism of architecture in Ancient Greece, Ancient Rome and to a lesser extent Renaissance architecture. Since it was widely based on Classicism, the movement was named Neo-Classicism. 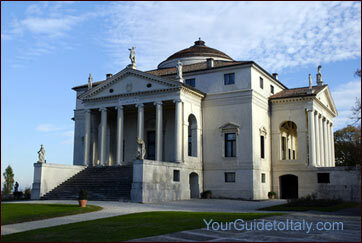 Everything from villas, palaces, gardens, interiors and art began to be based on Roman and Greek themes, and buildings were also widely themed on the Villa Capra "La Rotonda", the masterpiece by Andrea Palladio. See also: Teatro olimpico of Vicenza, palladian architecture at its finest. 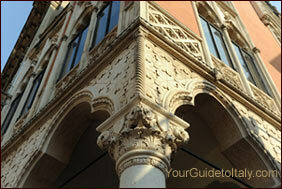 In the mid-19th century, Italy was also well-known for some relatively avant-garde structures. 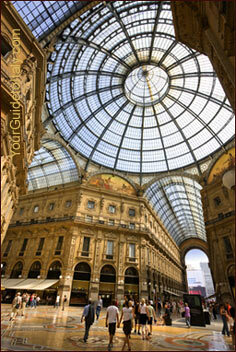 The Galleria Vittorio Emanuele II in Milan, built in 1865, was the first building in iron, glass and steel in Italy, and the world's oldest purposely-built shopping gallery, which later influenced the Galleria Umberto I in Naples. See also on our blog: 18 Italian records and superlative trivia. Examples of Neoclassical architecture in Italy include, Luigi Cagnola's Arco della Pace, the San Carlo Theater (Naples, 1810), San Francesco di Paolo (Naples, 1817), Pedrocchi Café (Padua, 1816), Canova Temple, (Posagno, 1819), Teatro Carlo Felice (Genoa, 1827) and the Cisternone (Livorno, 1829). Italian Neoclassical and 19th century art refers to painting and/or the plastic arts made in Italy or by Italian citizens in the Neoclassical period (late 18th - c. mid-19th centuries) and the 19th century. The European movement called "neoclassicism" began in Italy after 1750, as a reaction against both the surviving Baroque and Rococo styles, and as a desire to return to the perceived "purity" of the arts of Rome, the more vague perception ("ideal") of Ancient Greek arts, and, to a lesser extent, 16th century Renaissance Classicism. Indoors, neoclassicism made a discovery of the genuine classic interior, inspired by the rediscoveries at Pompeii and Herculaneum, which had started in the late 1740s, but only achieved a wide audience in the 1760s, with the first luxurious volumes of tightly controlled distribution of Le Antichità di Ercolano. Napoleon Bonaparte, who ruled most of Italy in the early 19th century hired Antonio Canova, one of the most influential Italian neoclassical sculptors and plastic artists to make sculptures for him, one of the most famous being that of Venus Victrix, an allegory of Pauline Bonaparte. Italy also developed several other artistic movements in the 19th centuries, like the Macchiaioli, who influenced French impressionism. The Macchiaioli were a group of Italian painters active in Tuscany in the second half of the nineteenth century, who, breaking with the antiquated conventions taught by the Italian academies of art, did much of their painting outdoors in order to capture natural light, shade, and color. They believed that areas of light and shadow, or "macchie" (literally patches or spots) were the chief components of a work of art. This practice relates the Macchiaioli to the French Impressionists who came to prominence a few years later, although the Macchiaioli pursued somewhat different purposes. The movement grew from a small group of artists, many of whom had been revolutionaries in the uprisings of 1848. In the late 1850s, the artists met regularly at the Caffè Michelangiolo in Florence to discuss art and politics. These idealistic young men, dissatisfied with the art of the academies, shared a wish to reinvigorate Italian art by emulating the bold tonal structure they admired in such old masters as Rembrandt, Caravaggio and Tintoretto. 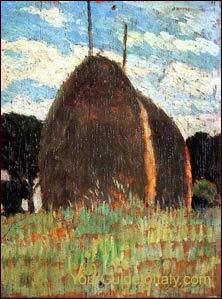 They also found inspiration in the paintings of their French contemporaries of the Barbizon school.The most notable artists of this movement were Giovanni Fattori, Silvestro Lega and Telemaco Signorini.